He is arguably the most notorious serial killer of all time, and perhaps one of the most infamous cult figures in history. Scarcely does the mere mention of ones name evoke such fear and imagery. The individual – or monster – responsible for the horrifying and ghastly murders that were committed in late 19th century London remains unknown to this day. For over one hundred twenty five years, professional and amateur sleuths alike have tried to piece together this unsolved mystery, yet no one has ever been able to definitively answer the questions who and why. What sort of person would have been capable of committing such horrible acts and why did they target such poor disadvantaged women? The legend of Jack the Ripper and his evil deeds is both terrifying and fascinating, and to this day, the gruesome series of Whitechapel Murders of 1888 endures as one of the most storied whodunits of all time. Jack the Ripper preyed upon ‘unfortunates' in the slums in and around Whitechapel, London. These were women who, due to extreme poverty, were driven to prostitution in order to sustain themselves. Most of his victims were women in their forties, apart from young Mary Jane Kelly, who was only in her mid-twenties at the time of her murder. It is unclear as to what fueled his savage bloodlust, but the murders all seemed to be methodical and calculating. The precise number of Ripper victims is not definite, but it is generally accepted that he killed five women, all of them prostitutes. His victim's throats were cut, often followed by abdominal mutilations, including organ removal in some cases. Based upon the precision of his cuts, it's assumed by many that the Ripper had anatomical or surgical knowledge. 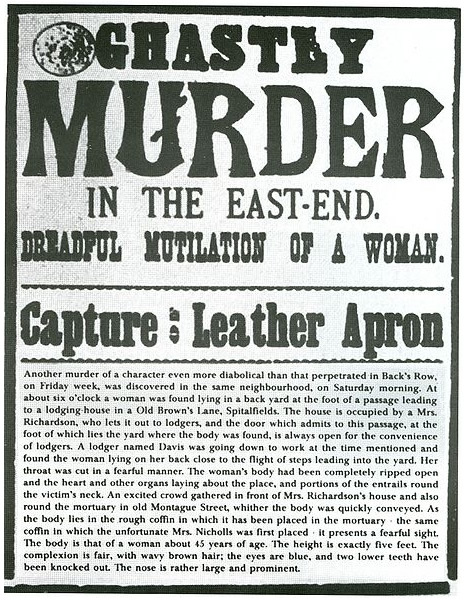 Jack the Ripper, or “Leather Apron” as he was sometimes referred, was bent on making a name for himself by leaving his grisly handiwork in plain sight. All of his victims were killed where they were found – most all of them horribly mutilated to varying degrees. The nature of the crimes, and the Ripper's ability to escape the scene undetected, made for quite the Victorian era media frenzy. The Ripper had successfully cast a veil of terror over an entire city and achieved worldwide infamy by word of his devilish deeds. Although there was a series of eleven Whitechapel murders that spanned from April 1888 to February 1891, it is believed that the Ripper's reign of terror began on August 31st, 1888 with the murder of Mary Ann Nichols, and ended with the ferocious slaying of Mary Jane Kelly on November 9th, 1888. There are many theories concerning what prompted the killer to cease his actions. Some believe it was due to the Ripper's sudden death, incarceration, or perhaps admittance to an insane asylum. Others feel his killing spree was precisely charted out and he had eventually completed his course. Thousands of people were interviewed, hundreds were investigated and eighty people detained, during and after the time of the murders. The trail of the Ripper had been closely followed by multiple police forces, including Scotland Yard, as well as a citizen formed vigilante committee. Among the highly suspect were: butchers, slaughterers, surgeons and physicians; this being due to their knowledge of anatomy. In the end, everyone interviewed provided sufficient alibis, which is why no one was ever officially accused or convicted. Much of the evidence in the case of Jack the Ripper was lost over the years, along with many of the facts pertaining to the murders being more based upon opinion than anything else. The legend of Jack the Ripper is therefore a combination of historical evidence, documented research and folklore. It is because of this, that the story of the Ripper has become something much more than an unsolved series of crimes. Over the years, Jack the Ripper has become an almost supernatural figure, and perhaps the most mystifying and enigmatic criminal of all time.